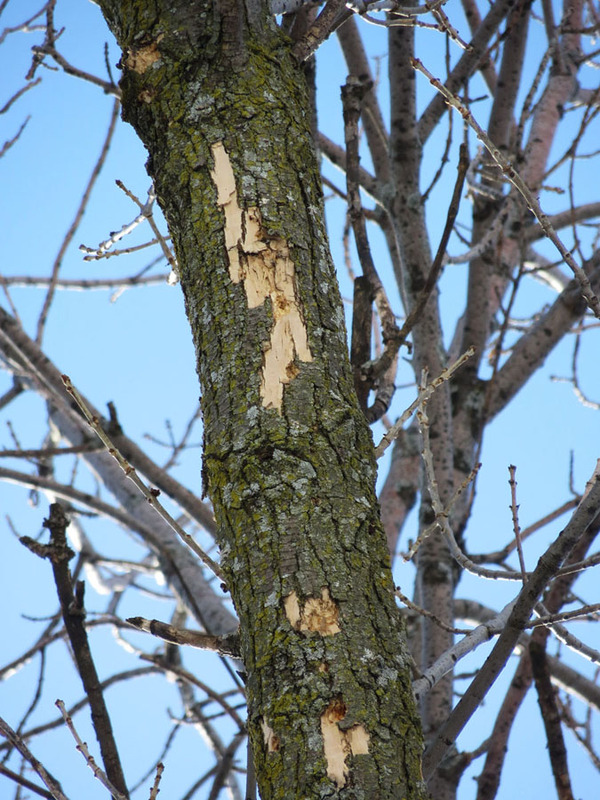 Winter is an ideal time to look for signs of emerald ash borer infestation because woodpeckers will do much of the hunting for those signs, according to state forest health specialists. Emerald ash borer is an invasive insect that kills all species of ash trees in Wisconsin. The larval, or worm-like, stage of EAB spends the winter months beneath the bark of infested ash trees. Woodpeckers pick away at the outer bark of infested trees in search of the nutritious larvae. This “flecking” of the bark is easily seen in winter, even from a distance, when trees are bare of leaves, according to Andrea Diss-Torrance, invasive forest insects program coordinator for the Wisconsin Department of Natural Resources. Flecking typically begins in the upper canopy and can be an early indicator of EAB activity before other signs are visible. Once a tree becomes heavily infested, flecking may be seen all the way down its trunk and branches. Diss-Torrance says by identifying early signs of EAB infestation people can address the problem before their trees become hazardous or too heavily infested for insecticide treatments to be successful. Light to moderately infested ash trees may be good candidates for insecticide treatment in the spring, but it can be difficult to detect these levels of EAB activity. By the time heavy damage is visible it is usually too late to save the tree. The advice of a tree care professional is recommended to evaluate ash trees for signs of infestation and to discuss treatment options. More information about EAB, including other signs of infestation and a map of communities known to be infested, can be found by searching the DNR website, dnr.wi.gov, for keywords “emerald ash borer” or by visiting emeraldashborer.wi.gov. To discuss management options for infested yard trees, contact a certified arborist through the Wisconsin Arborist Association at www.waa-isa.org.